47 min 3 sec ago. 20 hours 15 min ago. Republican AG hopeful Adam Laxalt was described by his firm's evaluation committee as "a train wreck" who "doesn't even have the basic skill set," according to a review of his performance two years ago. The assessment by the Lewis & Roca Associate Evaluation and Compensation Committee (AECC) suggested that Laxalt attend seminars to "address basic legal principles" because of his "horrible reviews" and because he "has judgment issues and doesn't seem to understand what to do." The recommendation: A "freeze in salary, deferral, and possible termination." The summary of the findings, which I have obtained, authenticated and posted below, is incredibly scathing and derogatory. The conclusion: "You need to work on the quality of your work. You need to work on your legal writing skills." Soon after this assessment by the firm, Laxalt was made "of counsel," a position that allowed him the luxury of not being evaluated. Not only was Laxalt known inside the firm to be pursuing a political career, but the evaluation also chided him for linking to "political articles" on the firm's website, a likely reference to his anti-gay-marriage screeds. Laxalt's brutal evaluation also was markedly dissonant from his self-assessment, in which he described himself as exceeding expectations and "outstanding" in his performance. That lack of self-awareness was also noted by the evaluation committee. Laxalt was hired in 2011, when he returned to the state, and he left the firm early this year to pursue the attorney general's job. 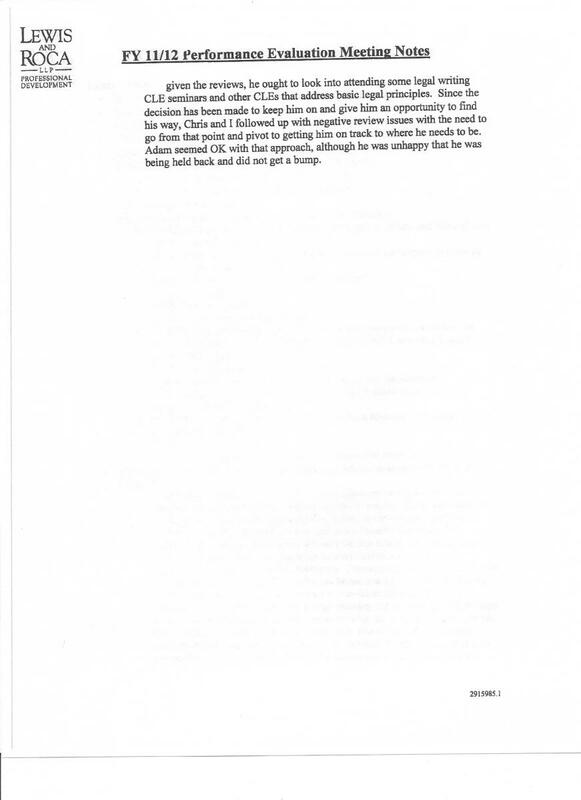 When he was asked about his performance at the firm by the Reno Gazette-Journal's Ray Hagar, Laxalt provided a letter that risibly argued he was "promoted" to Of Counsel. As you can see from the evaluation below, that is highly unlikely. I have asked Laxalt's campaign for a comment. I will post if and when I hear something. “The improperly and perhaps illegally leaked document today is not an evaluation that Adam Laxalt has ever seen before, and its authenticity as an official evaluation is clearly in question. Adam has been in touch with the firm this afternoon and he has been told that the process of authentication is currently underway. 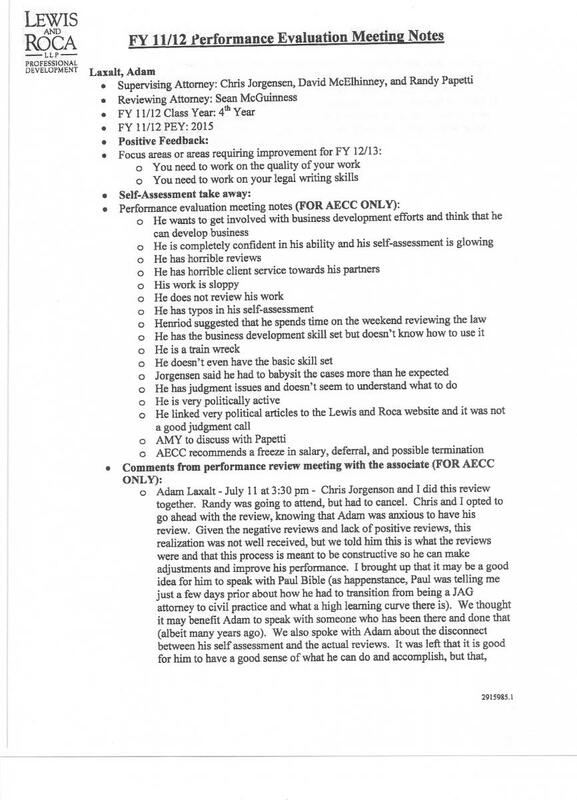 However, this document purporting to be an official evaluation was never given to Adam Laxalt. We will brief you with more information as soon as we have it." One note: I doubt that Laxalt ever would have been given the summary of findings. But it is authentic.